More than two of the three days of testimony in week 12 of the Colonies Lawsuit Settlement Public Corruption Trial was provided by the investigator for the district attorney’s office who supervised the probe into allegations that a Rancho Cucamonga developer extorted and bribed several high ranking public officials a decade ago. Now-retired district attorney’s office investigator Robert Schreiber offered testimony and evidence that undergirded a central element of the prosecution’s case as outlined in the 2011 indictment of Colonies Partners co-managing principal Jeff Burum, former sheriff’s deputies union president Jim Erwin, former county supervisor Paul Biane and Mark Kirk, who was the chief of staff to former supervisor Gary Ovitt. But Schreiber’s testimony was heard by only one of the two juries considering the case, that one assessing the guilt or innocence of Erwin. And Schreiber’s nearly three days on the stand subjected him to cross examination by Erwin’s attorney that brought into focus the tactics the district attorney’s office had applied and the intellectual honesty or lack thereof Schreiber had exhibited in making representations of his investigative findings when he previously testified before the grand jury that handed down the indictment. Erwin’s attorney, Rajan Maline, also carried on an exacting analysis of the evidence Schreiber personally extracted from Erwin during their verbal exchange while a search of Erwin’s premises had been ongoing in 2009. Erwin’s statements implicated Burum in the extortion element of the crime, which in accordance with the court’s granting of pretrial motions, is no longer part of the charges. And one of Erwin’s statements, amidst others, in some if not total measure cast doubt upon the bribery element of the crime, which does remain as an issue in the trial. Maline also brought into question Schreiber’s characterization of Erwin’s statements before the grand jury that handed down a 29-count indictment of the quartet in May 2011. And Maline locked Schreiber in on the handling and chain of custody of a tangible piece of evidence – a Rolex Daytona watch worth $12,765 which had been the primary piece of evidence seized during the January 15, 2009 raid on Erwin’s home. The chain of custody of that watch is an issue that carries with it the possibility of greatly eroding the credibility of the district attorney’s office when the prosecution’s case concludes and the defense begins calling its witnesses. In the case, prosecutors allege Jeff Burum, a Rancho Cucamonga-based developer coordinated with one-time sheriff’s deputies union president Jim Erwin to first extort, through the use of blackmail, intimidation and threats, former supervisors Bill Postmus and Paul Biane to obtain a vote conferring a $102 million payout to the Colonies Partners to settle the lawsuit that company had brought against the county over flood control issues at the Colonies at San Antonio residential and Colonies Crossroads commercial subdivisions in northeastern Upland. Burum and Dan Richards were the two managing principals in the Colonies Partners, who over the course of the seven months after the lawsuit was settled provided two separate $50,000 donations to political action committees controlled by Postmus, and separate $100,000 donations to political action committees prosecutors allege were controlled by Biane, Erwin and Mark Kirk. Kirk was the chief-of-staff to then-supervisor Gary Ovitt, whose vote to settle the lawsuit was critical in the 3-to-2 decision to approve the settlement. The indictment alleges the political action committee donations were thinly-veiled bribes made to Postmus, Biane and Kirk, who prosecutors allege influenced Ovitt and delivered his vote in favor of the settlement. Postmus, who served as county assessor after he left the board of supervisors, in February 2010 was criminally charged along with Erwin in a case predating but related to the allegations contained in the May 2011 indictment. Though Postmus initially maintained his innocence, he subsequently pleaded guilty to 14 separate felony political corruption-related charges, including conspiracy, bribery, conflicts of interests, and perjury. He turned state’s evidence and testified before the grand jury that indicted Erwin on charges superseding those leveled at him in 2010 and which also named Burum, Biane and Kirk. Postmus’ testimony, considered to be key to the case, is anticipated in the months or weeks ahead. Patrick O’Reilly, a public relations specialist who had worked on behalf of the Colonies Partners who testified last week, was yet on the witness stand Monday morning, March 20. After little more than an hour on the witness stand this week, O’Reilly was dismissed, subject to recall. O’Reilly had done substantial damage to Burum last week, admitting he had been paid a substantial amount of money – $250 an hour – by Burum to meet with members of the board of supervisors, in particular Postmus and Biane, to lobby them to approve the settlement and to confer with Burum and other members of his team in formulating strategies for promoting the idea in the media that the settlement was both justifiable and a less expensive alternative to losing the lawsuit in court and perhaps paying damages approaching or exceeding $300 million. Along the way, O’Reilly testified that Burum was involved in preparing so-called hit piece mailers targeting Biane which raised the issue of Biane’s insolvency. O’Reilly further confirmed that the subject of creating a hit piece targeting Postmus relating to his homosexuality was broached during a dinner meeting he had with Burum and Erwin at the Double Tree Hotel in Ontario on the night of October 18, 2006, although he attributed the idea to Erwin, and said it was one that Burum was not keen on. O’Reilly testified that Burum had checked into the Double Tree Hotel using O’Reilly’s name, obscuring his presence there. Postmus, who was due to engage as one of a contingent of county officials in a mediation session with the Colonies Partners and its representatives the next day, October 19, 2006 in Ontario, was also checked into the Double Tree that night. Without outright acknowledging he had done so, O’Reilly gave indication that on October 19, 2006 he had played a role as a conduit of confidential information relating to the county’s negotiating position on the Colonies lawsuit settlement that illegitimately flowed from Postmus to Burum. He acknowledged that Erwin was obtaining information from Postmus. He also confirmed, in his response to questions from supervising assistant district attorney Lewis Cope based on his cell phone records, that on October 19, 2006, during that mediation session, he had made 21 calls to Erwin and Erwin had made 16 calls to him. O’Reilly’s testimony had been damaging to Burum in large measure because he was in no way hostile to Burum but rather a close friend with whom he sometimes vacationed as well as served as a well-paid consultant. Monday morning, March 20, Cope asked O’Reilly if he had been called upon by Erwin in 2009 to assist him in determining the value of a Rolex Daytona watch that Burum had purchased for Erwin at the Tourneau Watch Store in New York City on January 29, 2007 as an expression of gratitude for Erwin’s assistance in helping the Colonies Partners achieve the $102 million settlement. O’Reilly said he indeed assisted Erwin in determining the value of the watch and that he obtained the information Erwin wanted by contacting Burum. When Cope showed O’Reilly an email that he had sent to Erwin, O’Reilly was able to peg the price of the watch at $12,765. Cope showed O’Reilly an accounting of the amount of money he and his public relations firm had been paid by the Colonies Partners between June 2004 and January 2009 which totaled $550,000. O’Reilly, who last week testified that he estimated the amount of money paid to him by Burum relating to the Colonies Partners settlement at $30,000, acknowledged that the $550,000 figure was very likely accurate. Cope then asked him if he had any money invested in the Diversified Pacific Real Estate Fund, which is an entity owned and controlled by Burum. O’Reilly said that he had been invested in the ten-year fund for nine years at this point and that investment had grown to a worth of just under $1.5 million. Cope ended his direct examination of O’Reilly at 10:10 a.m., expecting to be able to come back to him as a witness after the defense attorneys for the four defendants cross examined him. But in a strategic move, masterminded by Burum’s lead attorney, Stephen Larson, the legal teams for all of the defendants passed at questioning O’Reilly, choosing to get him off the witness stand before he could do any further damage. One of Burum’s attorneys, Jennifer Keller, stating that O’Reilly and his family had already been put through enough during the last eight years, said she would have no questions for O’Reilly on behalf of Burum. The attorneys for Erwin, Biane and Kirk, Rajan Maline, Mark McDonald and Peter Scalisi, respectively, followed suit. Before O’Reilly was dismissed, subject to recall, Cope asked O’Reilly about his previous testimony relating to Burum having provided him with a 1099 tax form for the watch that Burum had purchased for him at the Tourneau Watch Store on January 29, 2007, the same day Burum had purchased the Rolex Daytona for Erwin, likewise as a thank you gift for the assistance O’Reilly had provided in achieving the $102 million settlement with the county. To Cope’s question as to whether Burum had delayed providing that 1099 for two years and did not give it to O’Reilly until after a grand jury was impaneled in 2009 to look into the settlement deal, O’Reilly said he could not remember when he had received the 1099 relating to the watch from Burum. When Cope pressed him, O’Reilly acknowledged he had not received the 1099 until “several” years after he had gotten the watch. The next witness to be called was Bob Schreiber, but before he took the witness stand, Judge Michael A. Smith conducted a hearing on a motion brought by Erwin’s attorney, Maline, to suppress an audio recording Schreiber had made of his conversation with Erwin while a search warrant was being served at Erwin’s home. Maline asserted in the motion that Erwin was essentially being detained at the time the search was ongoing. Schreiber’s conversation with Erwin ensued shortly after Schreiber and the other investigators from the district attorney’ office arrived at the home and Erwin had just emerged from a shower and was clad only in underwear and a bath robe. This was tantamount to a custodial setting, Maline maintained, without Erwin having been read his Miranda rights. Schreiber was put on the stand and underwent questioning outside the presence of the juries, in which he said that he had made clear to Erwin that he was free to move about the home and that Erwin willfully engaged in the back-and-forth with him. Maline, noting that Erwin was unable to change into street clothes while the investigators were searching his bedroom and that the vehicles at the home were subject to the search as well, said the circumstance made it practically impossible for his client to leave. Smith, however, denied the motion, saying Erwin was not under arrest, had been informed he was not under arrest and was free to leave at any time. At 2:52 p.m. on Monday, Erwin’s jury came into the courtroom to hear Schreiber’s testimony. Schreiber, who is now retired as an investigator with the district attorney’s office, testified he headed up a team of six to eight of the office’s investigators that served the search warrant at Erwin’s Highland home on January 15, 2009. Schreiber said he and his fellow investigators arrived sometime between 7 a.m. and 7:30 a.m. and first encountered Elizabeth Sanchez, with whom Erwin was at that time in a domestic relationship. Sanchez was just about to leave to take several children to school. Schreiber said that while members of his team carried out a quick search of Sanchez’s vehicle, for which they had a search warrant, he accompanied Sanchez into the home and up to the second floor and into the master bedroom, where Erwin had just emerged from the shower and was still in his underwear. Shortly thereafter, Sanchez was allowed to proceed with taking the children to school. Very soon after arriving, Schreiber said he spotted the Rolex Daytona watch on the counter in the bathroom. The watch was a primary item specified for seizure in the search warrant, along with Erwin’s Blackberry communication device, his computers, records or any documents relating to the purchase of the watch or the January 2007 flight to New York and Washington D.C. with its fueling stopover in Kansas City, the case for the watch, paperwork pertaining to the watch and the outer box for the watch. Schreiber, who had been a deputy in the sheriff’s department before he became an investigator in the district attorney’s office, testified he was well acquainted with Erwin, as they had both begun as deputies in the sheriff’s department around the same time and were for a time working together in the department’s jail. He said he was wearing an audio recording device when he was at Erwin’s home which he activated shortly after he arrived. Much of the conversation captured on the recorder took place, Schreiber said, as the other investigators were engaged in searching rooms throughout the house and he and Erwin came out of the master bedroom and seated themselves in the loft area. An edited version of the tape was played for the jury. Heard on the tape is Erwin, prompted by Schreiber’s questions, acknowledging and illustrating key elements of the prosecution’s theory of guilt, which pertains to pressure being applied to Postmus and Biane to settle the lawsuit, with that pressure at times crossing into the realm of extortion. Erwin said Burum knew Postmus was a homosexual. “Was Burum aware?” Schreiber asked, referring both to Postmus’ sexual orientation and his drug use. “Yes, that’s fair,” said Erwin, but then qualified his answer when Schreiber followed up on the question. “What measures do you think Burum was taking to let Postmus know that he knew about his homosexuality or his methamphetamine use?” Schreiber asked. Erwin said Postmus “got mad” when he told him Burum knew about his sexual orientation. Schreiber inveigled Erwin into disclosing that Burum was also focusing on Biane and that Burum was using a private investigator to gather compromising information on both Biane and Postmus. “And how about Postmus?” Schreiber asked Erwin. “I remember going and meeting him [Burum] and Patrick O’Reilly in Ontario back in ’06 and he was pretty angry and he just said, ‘You know, I know what kind of drinks Postmus likes…’ He was trash digging or somebody was,” Erwin is heard saying on the recording. “He decided he’d play hardball and get private investigators and find dirt on them?” Schreiber asks. “Okay, how do you think it got communicated to Postmus and Paul Biane that Burum was aware of homosexuality issues or bill issues?” Schreiber asked. “I see, and so you told Bill that he was thinking of using homosexuality as an issue and he was prepared to expose that?” Schreiber asked. “I said, yeah, I mean, he was dirt digging,” said Erwin. “But you let him know, though, that Burum…” Schreiber began. “…is dirt digging,” Erwin concluded the sentence. When Schreiber sought to nail down the bribery element of the crime with Erwin, he made far less progress than with the extortion element. The closest Schreiber came to getting Erwin to acknowledge some order of payoff had occurred was when the investigator pushed him about the $100,000 contributions. “If the settlement hadn’t occurred, that money probably wouldn’t have been contributed, I would say,” Erwin conceded. There were, however, a number of statements on the audio recording, by both Erwin and Schreiber, that clash with the prosecution’s theory of guilt. At one point on the tape, Schreiber comes across as a character witness for Erwin. At one point, Erwin, who left the assessor’s office after ten months in the position of second in command there, indicated that it might have been his own reports of wrongdoing by Postmus and others working for him that had touched off the events that had led to the search warrant being served that day. “When I came into the public integrity unit [within the district attorney’s office where he had made a report of misuse of assessor’s office resources by Postmus and others], I knew that I was gonna have rocks thrown at me,” Erwin said. When Rajan Maline, Erwin’s lawyer, had the opportunity to cross examine Schreiber about his statements on the recording lauding Erwin’s truthfulness and honesty, Schreiber indicated his own words were not sincere. “You were lying to him?” Maline asked. With regard to Erwin’s suggestion that it was his own complaint to the public integrity unit that redounded to his detriment and led to his becoming a suspect himself, Maline was able to get Schreiber to acknowledge that Erwin in fact had come forward to the district attorney’s office with reports about the activity of the other assistant assessor in the office, Adam Aleman, relating to office facilities being used for partisan political purposes, among other abuses. When Aleman was summoned to appear before a grand jury regarding the matter and to produce documents and other material, he panicked and had an office employee alter several documents and he personally destroyed a hard drive in a computer that had been issued to him by the county. He then made material misrepresentations to the grand jury. On June 30, 2008, Aleman was arrested and charged with vandalizing county property, altering public documents and perjury. In October 2008, Aleman through his attorney approached the district attorney’s office, offering information of his own relating to what he knew of wrongdoing within the county, including information with regard to blackmail and bribery related to the Colonies lawsuit settlement. He undertook to assist investigators in gathering further evidence relating to his allegations, including making surreptitious audio recordings of those he said were involved. A year after his arrest, Aleman entered a guilty plea to the four felony counts against him. His sentence is being held in abeyance, pursuant to his continuing cooperation in the prosecution case against Burum, Biane, Erwin and Kirk. Maline zeroed in on the investigation relating to the activity in the assessor’s office targeting Postmus and Aleman, which his client had launched. “Wasn’t the issue at that point the malfeasance that was going on at the assessor’s office?” Maline asked. “That was one issue, yes,” Schreiber acknowledged. Maline pressed Schreiber with regard to Erwin’s cooperation during the assessor’s office investigation, ranging from his initial November 2007 interview with district attorney investigators to his testimony before a grand jury. Much of the information Erwin disclosed related to Aleman, Maline stated directly or implied in his questions. “He provided quite a bit of information, wouldn’t you agree?” Maline asked. “He certainly provided information to us,” Schreiber said. Maline suggested that it was Erwin who not only sparked the investigation but provided the lion’s share of the information gathered against Aleman which led to his conviction. “He provided information that corroborated information we got from other sources,” Schreiber said. Early in the afternoon on Tuesday, Schreiber did not return to the witness stand. Rather, Judge Steven Malone, who had been called as a witness and that day was presiding over a court trial in his courtroom, came into Judge Michael Smith’s courtroom to testify, having suspended testimony in the matter he was hearing for an agreed-upon hour to accommodate the prosecution. Like all of this week’s testimony except that of O’Reilly, Malone’s testimony was taken before Erwin’s jury alone. The jury hearing the case against Burum, Biane and Kirk are excluded from testimony based on statements made by Erwin because it is presumed at this point that Erwin will exercise his Fifth Amendment right to not testify and Burum, Biane and Kirk have a Sixth Amendment right to confront any and all of their accusers in open court. Malone said he had made Erwin’s acquaintance during his 2006 election campaign for judge, when Erwin had supported his candidacy and was instrumental in securing for him the support of the sheriff’s deputies union, the Safety Employees Benefit Association, known by its acronym SEBA. He said Erwin had advised him on how to proceed with his campaign, including advising him to make use of the money in his campaign war chest early to capture a convincing win in the primary against two other candidates, paving his way for victory in the November run-off. Cope questioned Malone about his contact with Erwin on what was either the evening of January 15 or January 16, 2009, in the immediate aftermath of the serving of the search warrant at Erwin’s home. Malone testified that he had learned of the search of Erwin’s home from both the discussion of the topic around the Rancho Cucamonga Courthouse, where he was then assigned, and from newspaper accounts. He said he called Erwin and arranged to meet him early that evening at Applebee’s Grill & Bar in Highland. Cope asked Malone, who was a prosecutor with San Bernardino County before he was elected judge, if Erwin had asked him to intervene with Ramos. Malone said Erwin did not. “Did he indicate whether he wanted you to actually speak with the district attorney to find out what was going to happen to him?” Cope asked. “I do not recall that,” Malone said. “He said, ‘I screwed up.’ Is that accurate?” asked Cope. Cope asked if Erwin had told him he had formed a political action committee. Malone said Erwin had told him so, but he was not sure that occurred during that meeting. Malone said he believed the committee was formed in relationship to the 2008 season and the campaign to defeat Dennis Hansberger as supervisor and replace him with Neil Derry. Malone exited from the witness stand at 2:15 p.m. to return to his courtroom. Schreiber returned to the witness stand following Malone’s testimony. During his cross examination of Schreiber, Maline explored the political enmity that had developed between Erwin and district attorney Mike Ramos. The pair had once been much closer. When Ramos first ran for district attorney in 2002, the sheriff’s deputies union, SEBA, of which Erwin was then president, had endorsed Ramos and had been a major contributor to his campaign fund. By 2009, however, relations between Ramos and Erwin had soured, in some measure over Erwin’s support of Neil Derry, who had defeated Dennis Hansberger in the race for Third District supervisor. Upon his election, Derry hired Erwin to serve as his chief of staff. Maline tried in vain, over prosecution objections that were sustained, to contrast the filing of criminal charges against his client in comparison to three campaign finance reporting violations Ramos had engaged in which were dealt with administratively by the California Political Practices Commission, which levied fines against the district attorney. Maline then took persistent aim at Schreiber with regard to the Rolex Daytona watch, which had been displayed in the courtroom earlier by Cope. Maline sought to ascertain from Schreiber the chain of custody on the watch and whether it had remained in an evidence locker, evidence room or safe at the district attorney’s office. Schreiber acknowledged that he likely had possession of the watch in the days shortly after the search warrant was served at Erwin’s home on January 15, 2009, but that it had been placed into an evidence storage room sometime after that and was eventually put into a safe on the district attorney’s office premises. Maline persisted in asking whether Schreiber had personally handled it outside of the near term aftermath of its seizure from Erwin’s home. Schreiber insisted it had been put away for safekeeping in the evidence room and the safe, but said at some point it had been removed from one of those repositories so it could be photographed and that he might have held it at that time. Maline made a close inquiry of the registration processes for evidence in the possession of the district attorney’s office. Schreiber said a log of evidence is kept and that each item of evidence is signed in when it is received and signed out when it is transferred to another agency or entity, such as the court. Maline wanted to know, however, what registration of each evidence item is made when it leaves the evidence locker or safe to be examined internally by a district attorney’s office employee or removed to another district attorney’s office location. Schreiber said no signing in or out of the evidence is done when it remains within the custody of the office, even if it goes from one location to another. “How about inside the office?” Maline asked. Maline also took issue with characterizations of evidence or statements Schreiber had made in his statements before the grand jury, including representing that at crucial points in his conversation with Erwin on January 15, 2007 that Erwin grew evasive, hesitant or made lengthy pauses to his questions relating to the alleged crimes at issue in the case. Maline pointed out that in one of those questions that cut right to the heart of the prosecution’s bribery allegations, Erwin had made a quick and direct answer by asserting there was no quid pro quo. But Schreiber had told the grand jury there had been a long delay in Erwin’s response. He focused on that portion of the tape to drive the point home with the jury. Maline asked Schreiber if he had discussed that issue with Cope and the other prosecutor on the case, California Supervising Deputy Attorney General Melissa Mandel, during a break after Maline had raised it earlier. Schreiber said he had. Cope objected and Judge Smith sustained the objection. There was no testimony on Thursday after a juror suffered a death in the family. The societal and legal shift from the strict prohibition of marijuana to its current state of legalization has and continues to create convulsions, including an unseemly scramble by elements of both the public and private sectors to secure positioning advantage and cash in on the new ethos of toleration. This has created the spectacle of public officials seemingly overnight going from arresting, jailing, prosecuting, convicting, fining and imprisoning individuals found to be using marijuana or possessing it in even relatively minute amounts to aligning themselves with entrepreneurs looking to cultivate it in massive quantities and market it to thousands or tens of thousands of end users. Moreover, the money to be made has had a corrosive influence on local governments, compromising the integrity of their land use, zoning, and business licensing functions. A case in point is in Adelanto, where one would-be cannabis mogul’s action in jumping the gun with regard to setting up a marijuana dispensary has created not just the perception and suspicion of illicit profiteering based on insider information and potential kickbacks to city officials but evidence that precisely that occurred. For more than a decade-and-a half, far along in the aftermath of the 1996 passage of Proposition 64, the Compassionate Care Act which allowed for the medical use of marijuana by patents who were adjudged by their physicians to potentially be assisted by the use of cannabis, Adelanto, like all of the other municipalities in San Bernardino County, refused to officially sanction the open operation of medical marijuana clinics within its city limits. Even after the Adelanto City Council declared that the city was in a state of fiscal emergency in June 2013, the city council as it was then composed considered any association with marijuana to be anathema, and its members said that aside from their distaste for the untoward impacts of encouraging marijuana use and intoxication generally, they were unwilling to license medical marijuana dispensaries in the city out of concern that doing so would worsen the city’s image and make business interests considering investing in or locating within Adelanto think twice, ultimately reducing tax revenue rather than enhancing it. In 2012, a full 16 years after the Compassionate Use Act of 1996 passed, Needles, a 4,844-population city located on the eastern shore of California and San Bernardino County at the Colorado River, became the first San Bernardino County City to embrace the liberalism the act implied. On November 26, 2012, Needles voters approved the adoption of a marijuana business tax ordinance and authorized the collection of a marijuana business tax of up to 10 percent of gross receipts. In December 2012, the Needles City Council set the marijuana business tax at the maximum 10 percent. Despite the pathway to revenue Needles’ action offer, Adelanto was in no hurry to follow suit. In 2014 Adelanto’s voters turned out 60 percent of the city council. In the November 4, 2014 election, mayor Cari Thomas and councilmen Charles Valvo and Steve Baisden were up for reelection. All three failed in those bids, with Baisden and Valvo ousted in favor of Charley Glasper and John Woodard and Thomas being replaced by Rich Kerr. That changeover had no appreciable immediate impact on the city’s consistent rejection of licensing marijuana operations, however, as Glasper, who had formerly served on the council, was one of the most outspoken opponents of marijuana liberalization in the High Desert. In the summer of 2015, however, a barely perceptible shift was underway. Glasper, while remaining opposed to clinics and dispensaries, where the product would actually be marketed, signaled he might consent to allowing cultivation operations in the city, given that producing the product in huge quantities might generate substantial tax revenue rather than nickels and dimes. That November, an ordinance allowing marijuana cultivation operations was passed. The council’s turnaround was a remarkable one, raising eyebrows and suspicions. Indeed, city attorney Todd Litfin resigned over the matter and the ordinance that emerged – still banning dispensaries and clinics where the product would be dealt to end users but allowing indoor nurseries within the city’s industrial park district, was birthed under the legal tutelage of interim city attorney Julia Sylva, who was hired on a 90-day contract the very day, November 18, 2015 the ordinance was first considered in public by the council. Since that time, there has been a stampede of would-be millionaires with dollar signs in their eyes into Adelanto City Hall. Even before the game changed once more in November 2016 when what was also known as Proposition 64, the Adult Use of Marijuana Act, was again approved by California voters, liberalizing the marijuana use atmosphere in California even further to allow those of the age of majority to imbibe it recreationally, Adelanto city officials took stock of the fact that they were already at the head of the marijuana sales bandwagon and could parlay that into even more money for the city. The question now of moment with law enforcement, including the FBI, is: Have some of those officials decided to cash in on the bonanza personally? Under the microscope is the case of an attorney, David Serrano, and his brother, Manny Serrano, and a long-neglected property on Adelanto Road. The Jet Room, located at 17535 Adelanto Road just south of Joshua Avenue, was a cocktail lounge that largely catered to airmen at the former George George Air Force Base. There had been hope that the bar would be able to sustain itself after George was shuttered by the Department of Defense in 1992 and the airbase was converted to a civilian aviation facility, now known as Southern California Logistics Airport. That hope never panned out, however, and the Jet Room and the 2.25 acres upon which it sits has lain dormant and dilapidating for close to a decade-and-a-half. On March 23, 2016, Dmitri Manucharyan purchased the property for $239,000. On October 3, in a seeming rush, David Serrano entered into escrow to take the old Jet Room off of Manucharyan’s hands, paying $450,000 for it. The transaction was completed on October 11. Serrano, who purchased the property in conjunction with his wife, said he intended to convert it into a law office. The broker on the deal was John Woodard, of Woodard Realty in Adelanto, the same Woodard who was elected to the city council in 2014. On October 26, the city council held a discussion about allowing marijuana to be sold to end users from dispensaries within the city. Amid a number of proposals, Woodard indicated his support for a proposed marijuana marketing zone that went no further south than Joshua Avenue, stopping slightly north of David Serrano’s newly acquired property, which at that time, was still being represented as the site of a future law office, or at least it was represented. Exactly seven weeks after Serrano closed escrow on the Jet Room, the Adelanto City Council held a public workshop, the upshot from which was a tentative proposal to re-zone two areas within the city in a way that would make them eligible to host medical marijuana dispensaries. With the passage of Proposition 64 three-weeks earlier, that meant that the dispensaries would be very likely at some future date be selling marijuana not just to those with medical prescriptions under the 1996 Proposition 64, but marijuana for recreational smoking purposes under the 2016 Proposition 64. Whoever had an inside track on setting up a pot shop in one of the proscribed areas stood a substantial opportunity to get rich. As it would turn out, one of those zones the council decided to designate was the area between Pearmain Street, Air Expressway, just west of Mesa Linda Road and Rancho Road. Contained within that area was the Jet Room. Involved in the public discussions relating to David Serrano’s recently-acquired Adelanto property was his brother, Manny. The Serrano Brothers’ sudden interest in the Jet Room made some people curious as to what was actually going on. The Serranos had previously bought a three-acre parcel in the city’s industrial park and had applied for a permit to operate it as a marijuana cultivation facility. And Manny Serrano is, or at least was, the official spokesman for the High Desert Cannabis Association. Meanwhile, David Serrano had submitted to the city plans for the conversion of the Jet Room into a law office. The declared intended use of the property allayed, at least ostensibly, the suspicion that something untoward had occurred. If indeed the interior of the Jet Room were to be transformed into offices for lawyers, paralegals, investigators and secretaries, the likelihood that it would be a storefront selling marijuana diminished. What has emerged, however, is that the offices Serrano is seeking to establish are highly atypical of the quarters for a law firm. Plans Serrano submitted to the city call for sales counters – two of them, each of which is at least 40 feet long – in addition to what is described as “a dispensing room,” a cashier station and a security room. In addition, the plans call for electrical facilities to accommodate extensive high-luminescence ceiling lighting. One interpretation is that the Serranos were provided with advance information that the City of Adelanto was not only going to reverse its policy of prohibiting marijuana retail sales within city limits but were told precisely where the zones where those sales were to be permitted would be designated. And the Serranos may not have been the only ones provided with that inside information. There was a flurry of activity with regard to land acquisition in Adelanto last fall, including six properties in the area being considered for the district in which marijuana sales will be permitted, four of which were finalized. In fact, on November 29, the very day the council held its workshop to discuss creating that retail zone, Industrial Integrity Solutions, which had already raised suspicions about its having previously participated in an inside information scheme in Adelanto when its parent company, Frontier Enterprises, bought 31 acres for its marijuana farm less than two weeks before the planning commission made a re-zoning of the property to accommodate that use, purchased property at 12011 Air Expressway. By buying the Air Expressway property before city officials indicated their readiness to put it into the marijuana sales district, Industrial Integrity Solutions cut hundreds of thousands of dollars or perhaps more than $1 million off the asking and eventual sales price on that property. Adelanto’s contract economic development director, Jesse Flores, has been championing the city’s efforts to attract cannabis retailers. His contract does not preclude him from representing business interests, and questions have emerged about his relationship to some entities looking to establish dispensaries. At question is whether those standing to make money off of the recently-manifested and still-manifesting changes in Adelanto’s ordinances have offered money – in the form of bribes or kickbacks – to the officials making those changes, whether those changes were formulated to advantage anyone already positioned in Adelanto in exchange for that generosity or whether information was provided to any of the entities that now stand to profit ahead of time in such a way as to allow them to so position themselves by securing property ahead of the escalating land costs. The matter is of interest to federal law enforcement and securities regulation officials because federal law is more sharply defined in this regard than is California law. Of note is that, as of now, before the re-zonings that will benefit those purchasers of the land are actually codified into an ordinance, all of the elements of a crime are not yet in place. Until the zone changes are made, it would be extremely difficult if not indeed impossible to demonstrate that any or all of the city council members were colluding with the land purchasers to alter city policy in their favor. A generation after Victorville exploited its political stability and cohesiveness to seize the day, seize the future, seize the Golden Triangle, take control of Southern California Logistics Airport, establish itself as an economic powerhouse as the host to the lion’s share of commercial activity in the Victor Valley and generally outmaneuver and outhustle the other municipalities in the High Desert, it has over the last decade made a gradual descent into political divisiveness now bordering on chaos. So contentious is the atmosphere that at council meetings, an extra contingent of sheriff’s deputies are now routinely on hand to maintain order and prevent riots from breaking out within the council meeting chambers. Victorville’s transition from the High Desert’s premier municipality to its present state would make a fascinating study in political science. It is difficult to know whether the change represents a function of the personalities of several mavericks and political outsiders who managed to get elected to the council in the last several election cycles or an organic transition in a city that has grown in population to well over 120,000, making it the second largest city behind Palmdale in both the Mojave Desert and all of California’s deserts, the fifth largest city population-wise in San Bernardino County and the 48th largest city in California. Victorville was the third city, after first Needles and then Barstow, to be incorporated in San Bernardino County’s expansive desert, having formalized its existence as a municipality in 1962. It beat neighboring Adelanto, which incorporated in 1970, to the punch, as well as neighboring Hesperia and Apple Valley, both incorporated in 1988, and the much more distant Twentynine Palms and Yucca Valley, which incorporated in 1987 and 1991. Victorville used its maturity and governmental organization to facilitate development and economic expansion. In competing with Hesperia, for example, in bringing in major retailers and thus capturing the accompanying sales tax revenue, Victorville facilitated the efforts of shopping center developers by being both proactively and passively receptive to development proposals, particularly along Bear Valley Road, the major thoroughfare that divides the two communities east of the 15 Freeway. In this way, much of the north side of Bear Valley Road is almost entirely built out with stores of all types, restaurants and to a lesser extent offices and professional service providers. The south side, belonging to Hesperia, is host to far fewer and far less intense commercial operations. Similarly, in the late 1980s and early 1990s, shortly after Hesperia incorporated and made a move to annex the so-called “Golden Triangle” consisting of the three-sided district formed between the intersection of Highway 395 and the 15 Freeway, west and east, and Bear Valley Road to the north, Victorville used both its administrative sophistication and the political wherewithal it had as a consequence of its bureaucratic maturity to outgun Hesperia. Hesperia’s effort to place the triangle, with its prime commercial properties fronting the well-travelled freeway and state highway, in its jurisdiction failed and Victorville laid claim to it and the bonanza of tax revenue it provides. When the Department of Defense shuttered George Air Force Base in 1992, Adelanto, which was the jurisdiction most proximate to the aerodrome, sought to take on possession of the base property with a proposal for the civilian conversion of the facility. But Victorville floated a competing proposal, which it did in conjunction with the County of San Bernardino and the City of Hesperia and Town of Apple Valley under the auspices of a joint powers effort, the Victor Valley Economic Development Authority. Adelanto found itself disadvantaged by the tremendous internal political rivalry it was plagued with, which essentially divided along the lines of those supporting Ed Dondelinger, a retired flight line sergeant at George Air Force who became Adelanto mayor, and Pat Chamberlaine, one of the original members of the Adelanto City Council who had acceded to become Adelanto city manager. The Dondelinger and Chamberlaine forces warred with one another, resulting in wave upon wave of recall efforts, many of them successful and resulting in one side and then the other temporarily prevailing over its rival and an ongoing accompanying lack of continuity and stability. During the 15-year time frame from 1990 to 2005, Victorville was ruled by eight council members who had few, if any substantial conflicts or disagreements. In the same time frame, Adelanto had more than 25 council members, some of whom did not remain in office for more than a year. Ultimately, because Victorville was able to offer, through the Victor Valley Economic Development Authority, a more cogent and coordinated takeover plan, the Department of Defense granted Victorville control of the base, which Victorville now administers as Southern California Logistics Airport. Victorville continued to bask in an atmosphere of political stability beyond the millennial transition. In 2008, however, in the last throes of the Bill Postmus political dynasty, Postmus, the one-time chairman of the county board of supervisors who simultaneously served as the chairman of the San Bernardino County Republican Central Committee, threw his support behind Ryan McEachron after Postmus had a falling out with one of his former allies, incumbent Victorville Councilman Bob Hunter. McEachron did not enjoy the endorsement and support of much of the rest, or any, of the political establishment other than Postmus and his supporters, who were nonetheless substantial. Hunter was one of three incumbents vying for reelection in the race, the other two being longtime councilman Mike Rothschild and Rudy Cabriales, who was Victorvillle’s one-time fire chief and a darling of the Victorville political establishment. In the eight-candidate November 2008 race, Cabriales and Rothschild cruised to victory with 17.45 percent and 17.04 percent of the vote, respectively. McEachron outdistanced Hunter 15.85 percent to 13.03 percent. McEachron’s victory marked the beginning of the end of Victorville’s political stability. The campaign between McEachron and Hunter had been a particularly hard fought and bitter one, with political hit pieces against McEachron having landed in voters’ mailboxes in the final stages of the race when the existing political establishment began to perceive him as a viable threat to Hunter. And though after McEachron was elected Hunter’s support network would make a grudging adjustment and reposition itself to make up with McEachron, offer him support as the newest member of the establishment and provide him with money as a favorite son in future campaigns, the code of civility that had accompanied the stability in Victorville had been breached. Two years later, in 2010, Terry Caldwell, who had been on the city council for 37 years, chose not to seek reelection. JoAnn Almond, who in 2006 had been reelected to four more years on the council with no effort whatsoever when no one ran against her and Caldwell, became the second incumbent turned out of office in as many election cycles when she was defeated by Victor Valley College Board Member Angela Valles. Jim Kennedy, another political newcomer was also elected with Caldwell’s endorsement. Upon taking her place on the Victorville council dais, Valles garnered a reputation as a political outsider perennially cast as a dissident challenging the status quo. She found herself crossing swords with Rothschild, McEachron and especially Cabriales. Saying she saw City Hall as tainted by “corruption and kickbacks,” she distinguished herself from her council colleagues, fighting them, if not at every turn, on a number of major issues. She alleged cronyism between the city’s elected officials and city staff, accusing the council of giving city employees raises while failing to make bond payments. She took major issue with Cabriales voting on a contract with the chamber of commerce when his wife was the executive director there. Under Valles’ withering attack and the criminal complaints she lodged against Cabriales, he chose to not run for reelection in 2012. Rothschild, who had been in office for 24 years, was defeated in that year’s race. Cabriales and Rothschild were replaced with Jim Cox, Victorville’s former longtime city manager, and Gloria Garcia. In 2014, Valles did not run for reelection and was replaced by Eric Negrete, while Kennedy was reelected. In 2016, Cox and Garcia garnered reelection but McEachron found himself on the outside looking in when he was outdistanced by two of the seven challengers in the race, Lionel Dew and Blanca Gomez. While the early returns and initial unofficial results favored Dew, in the end Gomez prevailed with 8,628 votes, or 14.12 percent, to Dew’s 8,224, or 13.45 percent. McEachron polled 7,394 votes or 12.1 percent. In a harbinger of what was to come, Gomez insisted upon being sworn into office by Valles on December 6, 2016. Almost immediately Gomez was emulating Valles in her role as the pepper in the pie or the skunk at the garden party, at engaging in what was for the rest of the council a minor irritant of not abiding by established meeting procedure and protocols. Initially, the council seemed understanding of her lack of familiarity with the process, such as wanting to initiate action that had not been agendized. But Gomez was soon at odds with nearly everyone, including her seeming mentor Valles. She sought to have the council proceedings translated in real time for Spanish speakers. The council resisted. On December 29 she attended a meeting in Rialto put on by newly elected Rialto Councilman Rafael Trujillo at which an effort to have Rialto declared a sanctuary city was the topic. This rubbed her council colleagues the wrong way, based on the perception she was using her status to support a cause the council as a whole did not support. Indeed, Gomez’s advocacy of immigration rights and her Democratic Party affiliation put her out of step with Valles, a Republican who last year made a run for county supervisor using a platform calling for greater vetting of and restrictions on immigrants into the United States. While Cox, Garcia and Kennedy endeavored to remain on collegial terms with Gomez, early on an enmity developed between Gomez and Negrete. Negrete was critical of Gomez’s open immigration advocacy, saying creating sanctuary cities would interfere with federal efforts to control immigration. The relationship between Gomez and the remainder of the council deteriorated, brought on in gradual steps as the council vetoed her first appointment to the planning commission, then rejected her second choice and then her third choice. By January, the contretemps had escalated to include Garcia, who is now serving as mayor. Gomez is not without her support base in the community, and the council meetings are now being attended by at least a handful of those supporters who have no hesitancy in being vocal in that support. This has, on occasion, exasperated Garcia, who seems fixated particularly, in preserving the decorum of the meetings. Over the last several council meetings she has made liberal use of her gavel and repeatedly declared, somewhat ineffectively, that Gomez is, and her supporters are, out of order. As a precaution, two and sometimes three sheriff’s deputies are on hand in the council chambers to ward off the possibility that the heated verbal exchanges might go physical. Ever the diplomat seeking a compromise or middle ground, councilman Kennedy made a motion to table the motion to censure Gomez and instead refer the censure to the city attorney to determine if the city had to have a policy relating to censures before initiating one. Gomez seconded that motion and the council supported that course rather than calling for the censure immediately. In the public comment portion of the meeting that ensued, there were residents who spoke either in support of Gomez or in support of the council majority. Some encouraged her to remain committed to her role as a dissident and others said she had disgraced herself and the city and should resign. The sudden initiation of grading to accommodate the San Manuel Tribe’s development plan for upwards of 30 hillside mansions on property adjacent to the unincorporated county land at the northeast corner of the City of San Bernardino has upset nearby property owners. The tribe, which has kept its intentions close to the vest, has autonomous land use authority over the property in question, and ultimately will be able to develop the property to whatever intensity it deems suits its purpose. The only external governance on those development plans is the requirement that the tribe redress whatever impacts the undertaking will have on neighboring land which lies beyond the reservation. Contrary to the alarm the grading triggered, the tribe’s spokesman said the eventual completion of the project will result in benefits to nearby residents, making rainstorm flooding far less damaging and reducing the fire hazard potential. The lack of public disclosure as to the tribe’s intent, however, taken together with its effort to utilize the impacts of the development on the neighboring properties to induce those properties’ owners to sell their land, has raised the ire of several of those impacted, many of whom are wealthy or well-fixed and want to maintain their residences in what has become a sanctuary for birds, butterflies, pollinators and other wildlife. A recent move to prevent homeowners in the area from accessing their property exacerbated the issue. What is more, because of the wealth of the tribe based upon its lucrative Casino operation and the political pull it now possesses as a consequence of the application of that wealth in endowing the campaign war chests of local elected officials, to say nothing of the consideration that the tribe’s former chairman is now the county supervisor overseeing the area at issue, neither the City of San Bernardino, nor the County of San Bernardino appears willing to use their governmental authority to confront the tribe on behalf of any residents who feel they are being put out by the development. The area concerned is that lying at the furthest northward extension of Orange Avenue, which then winds in a loop eastward to become Holly Circle Drive. The hillside property towering over Orange Avenue was formerly owned by Jack Widmeyer. Widmeyer, a local insurance agent, had sought to develop the property, but ran into difficulty when he began grading the property without permits and was caught attempting to bootleg other elements of the infrastructure needed to render the property developable. The city refused to provide him with permits or an entitlement to build. Ultimately, the property was sold to the San Manuel Tribe, which incorporated it into its reservation. What was previously reported and now confirmed is that the tribe is looking to construct $2 million to $5 million homes on one-acre hillside lots as residences for tribal members who have now reached the age of majority, i.e., 18. Unverified reports are that the revenue generated at the San Manuel Casino provides each member of the tribe with roughly $100,000 per month. The property at the north end of Orange Avenue is unincorporated San Bernardino County land, outside the bounds of the City of San Bernardino but within its sphere of influence. Personnel with the San Bernardino County Land Use Services Department were either unable, unwilling or not at liberty to disclose whether county planners had been consulted with regard to the ongoing project. The immediate past chairman of the county board of supervisors is Third District Supervisor James Ramos, who was formerly the chairman of the San Manuel Tribal Council. Previously, San Bernardino city officials said they had no knowledge of what the tribe had in store for the property or that there was any current plan to develop it. Councilman Fred Shorett, whose council ward is immediately adjacent to the project site, had been provided with a fact sheet relating to the tribe’s intention, but was not at liberty to disclose what had been vouchsafed to him on confidential terms by the tribe. Oliver Mujica, the planning division manager for the City of San Bernardino, this week told the Sentinel he had no information about the project. Repeated efforts by the Sentinel to get in touch with San Bernardino Community Development Director Mark Persico that began last week and included seven phone calls and attendance at this week’s city council meeting were unsuccessful. In June of last year, after surveying of the property intended for development had taken place and displaced earth and mud had made its way into storm water channels and culverts designed to prevent flooding of the properties along Holly Circle Drive and upper Orange Avenue, thereby clogging them, representatives of the tribe approached at least some of the homeowners. Noting that those properties were threatened by flooding, the tribal representatives made offers to buy the properties. Earlier this month, massive earth moving vehicles wended their way up Orange Avenue and Holly Circle and ultimately into place near the sites slated for development. No formal announcement was made to the nearby landowners that the project was imminent. Nevertheless, the landowners surmised what was to come. At one point, Orange Avenue and Holly Circle were choked closed with grading and earth compaction vehicles. Local residents seeking to get back into their neighborhood were informed by the equipment operation crews that they would not be able to pass. Sensing or anticipating discontent among nearby residents, a tribal official approached City of San Bernardino officials and provided a document prepared by Bryan Benso, the director of real estate and development with the San Manuel Band of Mission Indians. In that document, Benso maintained the tribe intended to build somewhere between 30 and 40 homes. City officials were informed by the tribal elders within the last two weeks that grading equipment was being staged in the area, but that grading would not begin until March 17. The tribe then jumped the gun, beginning to grade in earnest on the Ides of March. On March 23, Jacob Coin, the public affairs director for the San Manuel Tribe, spoke with the Sentinel. He said the tribe has coordinated with local authorities. San Bernardino County in the last year experienced a marginal drop in the number of homeless individuals and families living within its expansive borders, according to the official census of the displaced carried out annually. The tallying of the San Bernardino County’s destitute, referred to as the “point in time count” was carried out on January 26 of this year. According to that accounting, the number of the dispossessed living on the streets, in parks, beneath railroad trestles, under freeway and roadway bridges, in riverbeds, alleyways and other places unsheltered dropped by one percent of the displaced population a year before. The results of this January’s point in time count were presented March 22 to officials with the San Bernardino County Interagency Council on Homelessness. The reduction in the county’s itinerant between January 2016 and January 2017 was minuscule compared to the 12% decrease registered between January 2015 and January 2016. Still, officials were able to find a silver lining in the statistics. According to the 2017 count, 1,866 homeless people were documented as being in the county on January 26, 2017 as compared to 1,887 on January 28, 2016, a reduction of 21 people or a 1 percent downward trend. The survey cataloged 1,179 of those homeless as “unsheltered.” Within the unsheltered category, there was a reduction of 13 during the year from 1,191 in 2016. Of the homeless population, 73 percent are adult males. The survey found 14 unaccompanied minors and 26 children in families. The predominant ethnicity of the homeless in San Bernardino County is shown as those identified as “white,” at 67 percent. Hispanic/Latinos accounted for 24 percent. In descending order, the cities with the highest homeless populations were: San Bernardino: 491; Redlands: 164; Victorville: 157; Upland: 127; Ontario: 91; Rialto: 91. The federal government uses the annual point in time count to apportion federal funds intended to deal with homelessness. 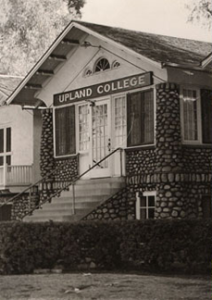 Upland College, located at the southeast corner of Arrow Highway and San Antonio Avenue in Upland, was an institution of higher learning founded by the Brethren in Christ Church as Beulah College in 1924. It was considered a West Coast satellite campus of the Brethren in Christ Church’s Messiah Bible School and Missionary Training Home in the east. The College was shuttered in 1964. Toxicodendron diversilobum (syn. Rhus diversiloba), commonly named Pacific poison oak or western poison oak, and known by it scientific names Toxicodendron diversilobum or Rhus diversiloba), is a woody shrub-like vine in the Anacardiaceae or sumac family inhabiting conifer and mixed broadleaf forests, woodlands, grasslands, and chaparral biomes. It is widely distributed in California. Indeed, the native inhabitants of California before the arrival of the Spanish in the 1700s referred to what is today Los Angeles as Yangna or Iyaanga, which means poison oak place. As with other members of the Toxicodendron genus, T. diversilobum causes itching and allergic rashes in roughly four-fifths of humans who touch or brush up against it. It can have even more serious consequences in those who inhale the smoke from it when it is burned. Toxicodendron diversilobum leaves and twigs have a surface oil, urushiol, which causes an allergic reaction in the form of contact dermatitis – an immune-mediated skin inflammation involving inflammation, colorless bumps, severe itching, and blistering. Repeated exposure ups sensitization to urushiol, which also exists in the peel of mangos. Toxicodendron diversilobum is common in various habitats, from riversides with adequate water to areas of the foothills near the desert where rainfall is far less or barely extant. It often occurs in chaparral and woodlands, coastal sage scrub, grasslands, and oak woodlands; and Douglas-fir (Pseudotsuga menzesii), hemlock–Sitka spruce, Sequoia sempervirens (coast redwood), Pinus ponderosa (Ponderosa pine), and mixed evergreen forests. It thrives in shady and dappled light through full and direct sunlight conditions, at elevations below 5,000 feet. The vining form can climb up large shrub and tree trunks into their canopies. Sometimes it kills the support plant by smothering or breaking it. Poison oak is variable in both appearance growth patterns. It will grow into a foot-and-a-half to 13-foot high shrub in open sunlight, a treelike vine of up to 30 feet, and grow to more than 100 feet long with a three to eight inch trunk, or as dense thickets in shaded areas. It breeds by spreading rhizomes and by seeds. The plant is winter deciduous, with its stems leafless after cold weather sets in, though sometimes bearing berry clusters. The leafless stems occasionally sport black dried sap marks. The plant has three leaflets that are one-and-a-half to 4 inches long, with scalloped, toothed, or lobed edges, in some degree resembling the lobed leaves of a true oak, though more glossy. Leaves are bronze upon unfolding in February to March, bright green in the spring, yellow-green to reddish in the summer, and bright red or pink from late July to October. White flowers form in the spring. When the plant is well nourished, the flowers become greenish-white or tan berries. Black-tailed deer, mule deer, California ground squirrels, western gray squirrels, and other indigenous fauna feed on the phosphorus, calcium, and sulfur-rich leaves. Some bird species will shelter in the plant and feed upon its berries. Domesticated animals do not appear to be sensitized to urushiol. The plant has medicinal properties. Indigenous California Indians used the plant’s sap to cure ringworm, and applied a poultice of fresh leaves as a palliative to rattlesnake bites. An infusion of dried roots, or buds eaten in the spring, were taken by some native peoples for an immunity from the plant’s poisons. Chumash Indians used T. diversilobum sap to remove warts, corns, and calluses; to cauterize sores; and to stop bleeding. A decoction made from the roots was utilized to treat dysentery. Jeans are in fashion and with a hint of creativity because there’s a demand for a high cuff or a step hem. The high hem can be pulled up to a height using either a loose, straight, or skinny jean and you can go as high as below the knee. No hemming needed here, just a plain over-the-top fold, throw a t-shirt on, and a pair of cute booties, or sneakers, and you’ve set in the trend. There’s a real cool feel to that look, too. The neat thing is the high cuff comes with choices you can store buy or do yourself. Whatever you decide, you won’t be visiting a seamstress this season because the attention is at the cuff. The stepped jean is another do-it-yourself piece, but you can store buy this hem, too. The stepped hem is perfect with sandals, heels, and sneakers. It’s easy to do it yourself: Just take a pair of jeans, highlight, cut shorter at possibly to ankle bone length at the front, and make the back about 1½” longer. The neat thing is the step hem looks great with flats and heels. The hem is pretty interesting and can turn out to be a flattering cut because it helps elongate the leg, and shows a dash of skin. Spring is definitely into unique hemlines, with uneven hems that create a step, and exaggerated cuffs. Have fun going all out rolling your cuffs to your calf area, or unevening your hems. Make this a fashionably unique season!